About Komo’s English class@Rikuzentakata Based on the founder’s belief that the disaster area should develop global talents faster than many other areas in Japan. The classes focus on teaching the essence of English, and encourage self-directed study through coaching. The program started in November 2011, and plans to continue until 2021. The coaches commute to Rikuzentakata from Tokyo on a monthly basis. A group of professionals in Tokyo started to make progress in their business English. This monthly meeting was the origin of Komo’s English class@Tokyo. It developed to be a large community which learn real business English by using the business-oriented materials, e.g. annual reports of international companies. Its regular format is to have dinner together at a restaurant in Tokyo and then read aloud the material together. 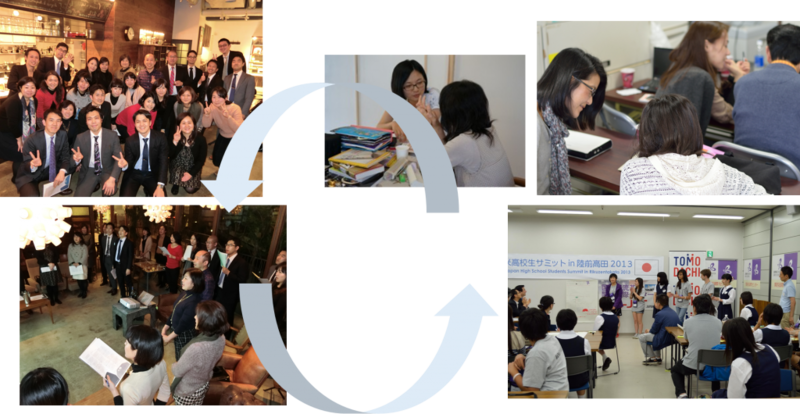 Since 2014, the participants of Komo’s English class@Tokyo donate JPY 1,000 in addition to the cost of food and venue every time. Also, some of the participants commute to Rikuzentakata to coach the participants in Rikuzentakata, or join the tour to learn the disaster in Sanriku area (north-east coastal Japan). The sustainable support cycles bloomed in 2014. If you have an interest in our activities, please feel free to Contact us. We look forward to your participation!